Why Choose At Home Designs? We Believe In the Value of Good Design. Design shapes the world as we experience it through our senses. It changes our sensations and emotions, and how we experience life from everyday living to special moments. A space that is beautiful is not only visually pleasing, it is a comfortable, inviting space. 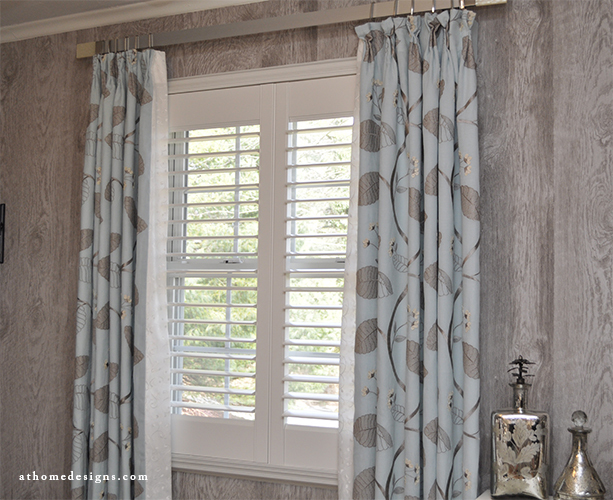 Custom window treatments and home interiors can be made easy and are essential in tailoring your home to your needs. Quality, beauty, attention to detail, and functionality are at the core of everything we do. Your comfort is what matters to us. We believe in working hard to provide outstanding products and services. Most of all, we love what we do! Our in-depth product knowledge and experience allows us to be intimately involved with the design, fabrication, and installation of every project. Our clients rely on us for our creativity and personalized service. Our staff, from product selection through installation, hold the highest level of respect for our clients. We are mindful of your time, wishes, and respect your home and property. Owner Margie Booth has enjoyed over 25 years of experience in the home interiors industry- from window blinds and shades, to furniture and wallcoverings, paint and more, she has extensive experience in all elements of home design. After a decade of experience in the industry, Margie opened At Home Designs in 2004. Over the last 14 years, her showroom has tripled in size. The name At Home Designs comes from the belief that has always resonated in Margie’s work; a home that is beautiful should also be comfortable, and designed to feel At Home. A cornerstone of Margie’s design technique is to make a space beautiful not only for now, but for years to come. Margie and her staff love connecting with clients on a personal level to create solutions for their design and everyday living needs. Design choices can be overwhelming with hundreds of elements to choose from; herein lies Margie’s great talent of reading her clients’ needs and simplifying the process for them. As a lifelong learner who is excited about all aspects of design, she passionately keeps her beautiful showroom up-to-date with the latest styles, including interactive displays featuring the full line of Hunter Douglas shutters, blinds and shades. At Home Designs would be honored to guide you on your next design project; whether you’re looking for a single room or whole house solution, we’re here for your home interior needs. Book an appointment today to get started, 302-239-1520.